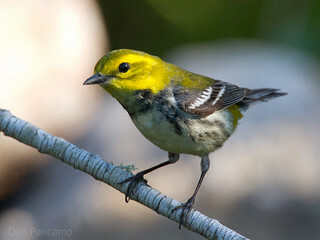 The Black-throated Green Warbler, Dendroica virens, is a small songbird of the New World warbler family. It is 12 cm long and weighs 9 g, and has an olive-green crown, a yellow face with olive markings, a thin pointed bill, white wing bars, an olive-green back and pale underparts with black streaks on the flanks. Adult males have a black throat and upper breast; females have a pale throat and black markings on their breast.